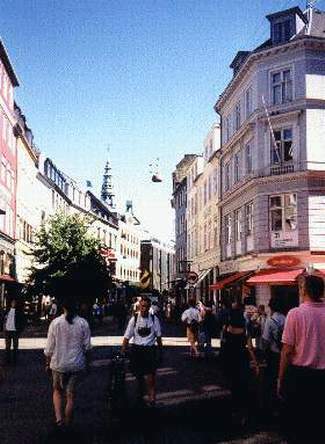 The most popular street in Kbh is Strøget, the walking street. This is "the strip" where everyone cruises, but on foot rather than in a car. Along Strøget you find the in-shops, the sidewalk cafés, exotic resturants, book & music stores, street singers & jugglers do their acts along the way, peddlers sell jewelry & whatnot, chess & backgammon players hold contests, student painters copy Raphael in chalk upon the street tiles, roller skaters roll by in flock, even Hari Krishnas pass through every now and then. Everyone passes through this street at one time or another; gawking tourists, busy danes, drunk swedes, and some of the prettiest girls you'll ever see anywhere. It's a busy place in the daytime, all the classy clothes stores, Gucci, Italian shoes, Royal Porcelain, etc, but it's also amusing to take an evening stroll along Strøget (which literally translates as "the stroll"). That's when the street entertainers put on their shows: any-nationality guitar players, Russian accordianists, Peruvian flute bands, at least one Japanese sho, violinists, puppeteers, acrobats, stand-up comics (usually in English), take your pick. Some are just passing through, earning a little money while travelling around Europe, others are regulars who stand there often. Many of them are quite good. 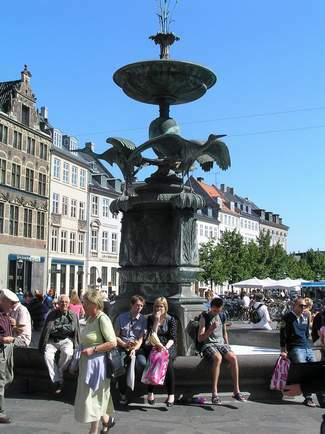 In fact, when Bruce Springsteen was last here in Kbh to give a concert, he sneaked out of the Hotel d'Angleterre (on the Kongens Nytorv end of Strøget) alone, taking his guitar, and went down the walking street until he found another guitar player...and started jamming with him. It didn't take people long to figure out who he was (there were posters all over town that he was here) and he ended up drawing quite a crowd. A passerby videotaped the event and it was on tv next evening. Bruce was regarded as a folk hero in Danmark after that. 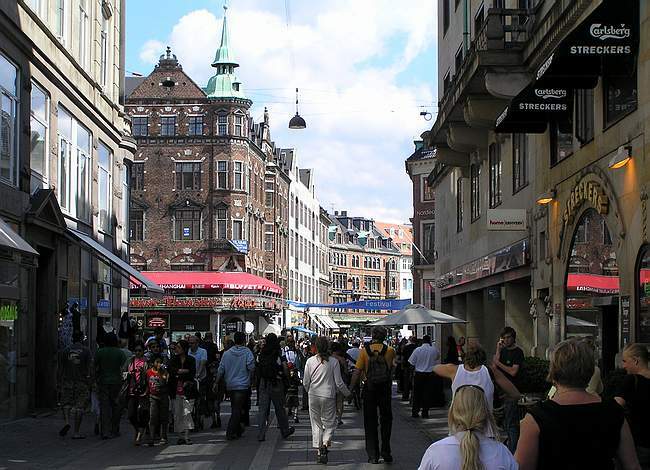 Another walking street crosses the original Strøget, to the right you see Købmagergade, together they form a large area of the old Inner City where you can walk around without car traffic, which makes it all very easy-going and relaxing. When I first came to Kbh in 1965 Strøget seemed like a new idea. Now every city in the World probably has an area something like it. But back then it was the local version of a shopping mall for a city that wasn't structured around automobile traffic. So few people even had cars back then, bicycles were the main means of transportation-- for many they still are. 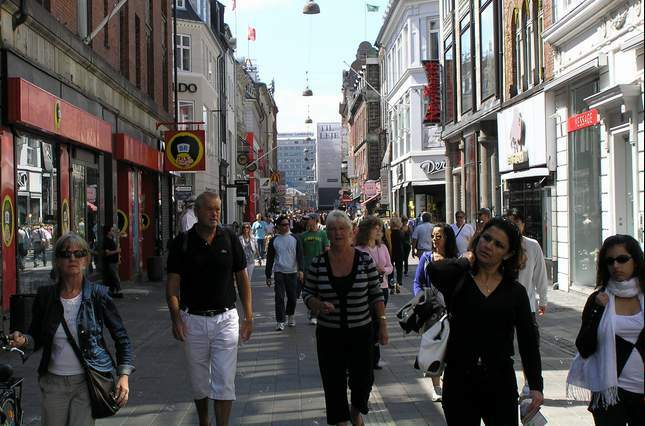 Of course, now there are lots of cars, and shopping malls have started cropping up around Denmark, but there is still some resistance to that lifestyle: whenever a big mall pops up, the local downtown shops are doomed, the city centers die, business moves out. Seen it in the States, seeing it here too, and most people don't want it to happen.